Large sheet 24.4"x38.3", design 21"x33.3"
Small: sheet 24.25"x36", design 21.7"x31.9"
Here's another one of our favorite trellis patterns: Hacienda stencil. Based on a traditional tile pattern, this trellis design is perfect for accent walls in guest bedrooms, hallways or dining rooms. Offered in 2 sizes (scales), so choose one that perfectly fits your space. In general, larger scale is better for larger rooms, and vice versa. 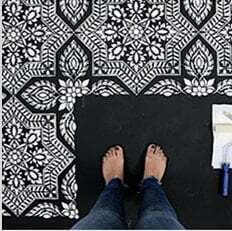 Larger scale is also great for stenciled rugs and curtains. This is a "filler" stencil, meaning you're filling in the pattern as opposed to outlining it. Keep this in mind when choosing your base coat color. Refer to Actual stencil picture (the last black and white picture) to see where the paint goes.